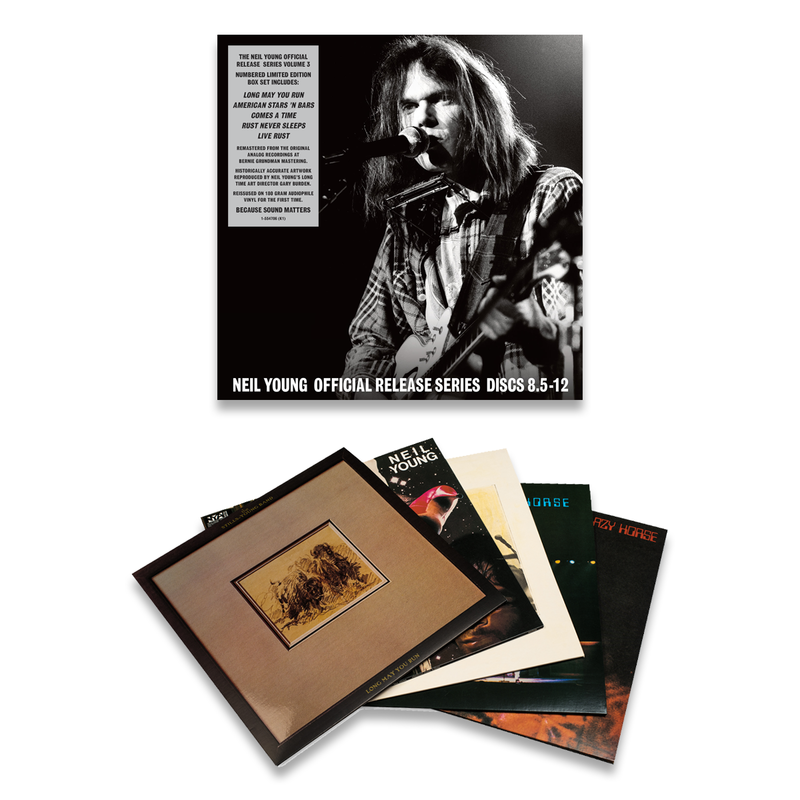 Neil Young's Official Release Series - Discs 8.5-12 (Box Set) will be released on November 25th. Young's "Official Release Series" continues with the next set of chronological titles to include: Long May You Run (The Stills-Young Band - 1976), American Stars 'N Bars (1977), Comes A Time (1978), Rust Never Sleeps (1979), and Live Rust (1979). Each title has been remastered from the original analog recordings by Bernie Grundman Mastering and pressed on 180 gram Audiophile black vinyl. Official Release Series Discs 1-4: Neil Young, Everybody Knows This Is Nowhere, After The Gold Rush and Harvest. There's no gap between 8 and 8.5 -- just that he apparently didn't feel comfortable calling the LMYR album #9, and shouldn't. That's all. Anyone know if these are numbered? @wardo - makes sense, sort of, but it seems to also be kind of back-handed calling a Stills-Young release a ".5". Not that Stephen really cares, of course. And LMYR is quite a fine release if we do say so. @Mike - not sure but given that there is nothing specifics about #'s, probably not. Darn these prices. Unfortunately, I'm compelled to get this one to keep my collection going! Not to mention, depending on how many are produced, prices for these can shoot up in a year or two. I wonder whats going to happen with the 4th boxset, as his next two albums were on Reprise, while, the next 5 were on Geffen, and them back to Reprise for the rest. I assume they will come in the order of release ? @John- Good theory. Except this is the Official Release series. Amazon (UK) just put my delivery date back to 23 December... 2016, I assume. Amazon (USA) just sent me the same date. Why must the Archives projects always be so difficult? Hey Mike Edwards, I got mine and I can't find the number even though it said "Numbered Limited Edition". Did anyone else get one and it not have a number? Typical! You can get the numbered edition exclusively on Neil's website! Only 1500 copies though so be quick if you want one! I've ordered mine and am going to sell my unnumbered copy for a knockdown price as I opened it! It pays to wait- wish I had! Least I'll have all 3 sets now and NUMBERED!! Looks like the CD releases are scheduled for May 12, 2017! A long time to wait to have Time Fades Away on an officially released CD!